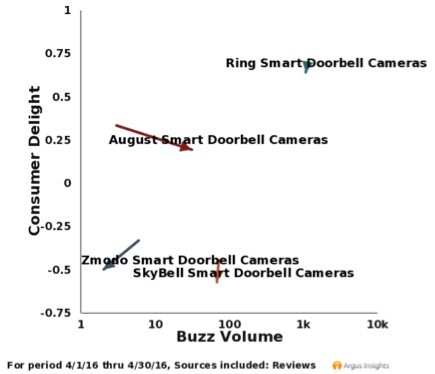 Ring dominated the Smart Doorbell market in April, but August saw a boost in buzz, taking a small bit of attention away from the market leader. 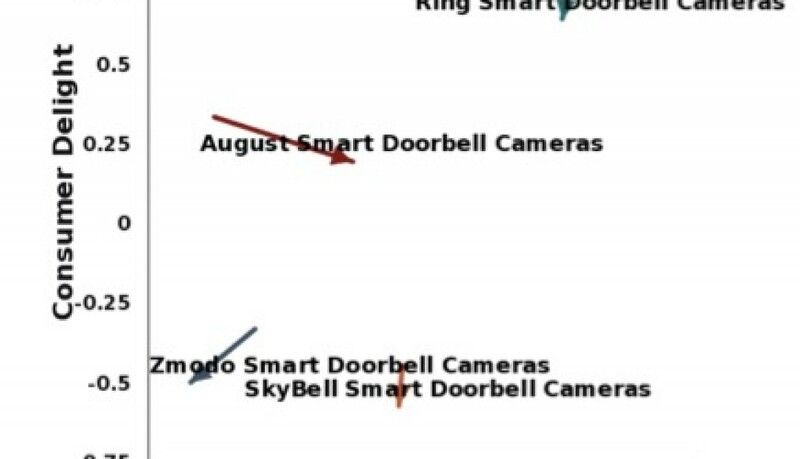 Competitors Skybell and Zmodo are disappointing user who opt for a different experience, solidifying Ring’s clout with consumers. 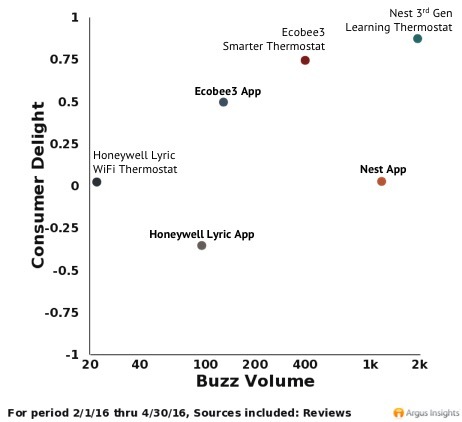 Get analysis of the top 5 brands in every Smart Home category plus analysis of service providers, ecosystems, apps, and retailers in our Smart Home 360 report. It’s the most comprehensive analysis of the Smart Home market available, download a free sample of the report today. Sign up for our free Smart Home newsletter to get regular updates on what is trending in the market. 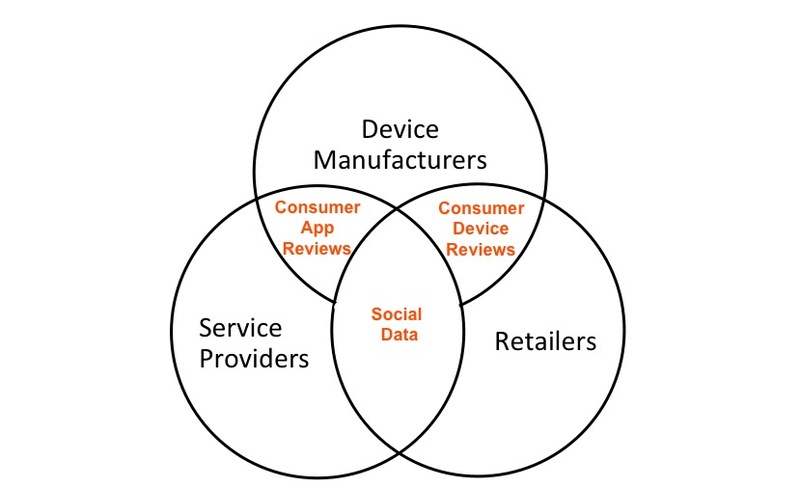 You can also explore our Smart Home press releases and free market reports to learn more about consumer preferences in ecosystems, devices, and applications. As more Smart Home devices hit the market, the need for connectivity and device communication remains as important as ever. Amazon filled this need with the introduction of the Echo smart speaker and subsequent slew of partnerships. Amazon made Alexa a viable voice for any Smart Home by creating a multi user environment and inviting other companies to easily integrate. Amazon’s strategy has been paying off, as it has led to impressive interest and satisfaction with consumers. Nest recently announced that the company will open its Thread Smart Home framework to third party developers. This move will make it easy for Smart Home device manufacturers to use Nest’s network instead of building their own from scratch. By opening the doors to their previously walled garden, Nest is inviting the rest of the market to easily communicate using their protocol. Currently, Smart Home users show far more interest in Amazon’s solution than Nest’s, will this open framework help Nest gain mindshare as a Smart Home ecosystem? 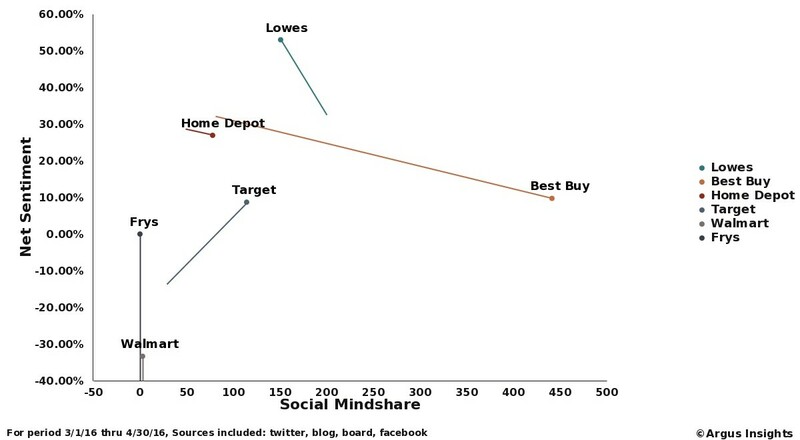 We will continue to track consumer perception, check back on this blog for updates. 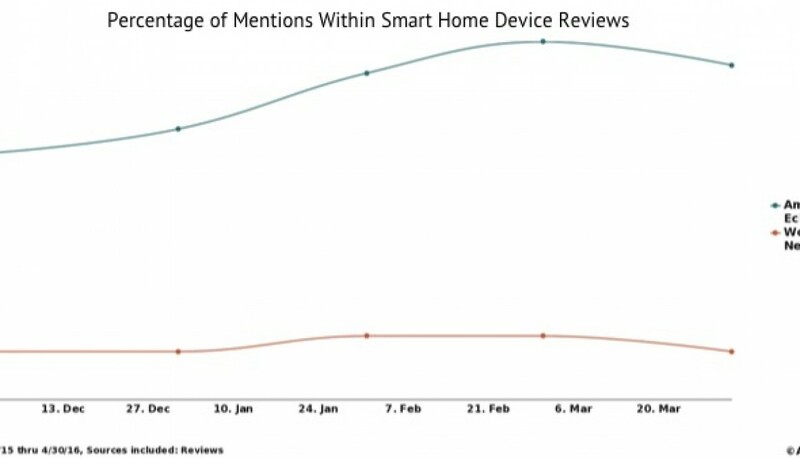 Chart of the Day: Smart Home users far more interested in Amazon’s Smart Home solution than Nest’s, but Nest just announced they will open their framework. 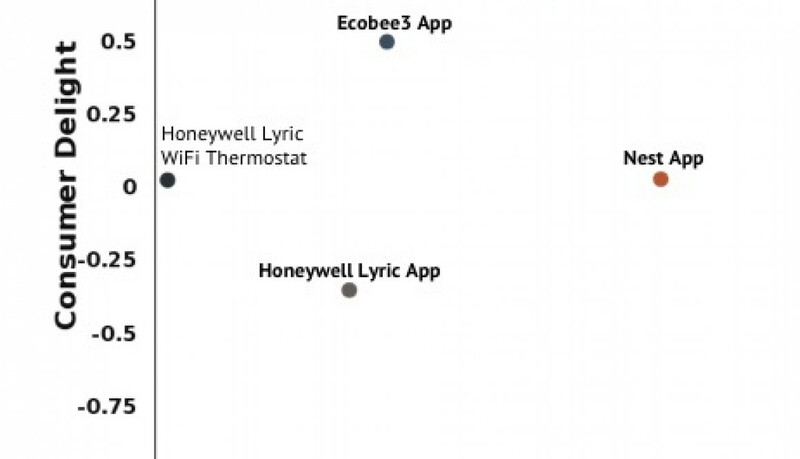 Check out our free Smart Home Ecosystem report for a more detailed analysis, plus insight into HomeKit’s effect on the Smart Home market. You can also get regular insights delivered to your inbox with our free newsletters. Retailers are not a driving force in Smart Home discussion. 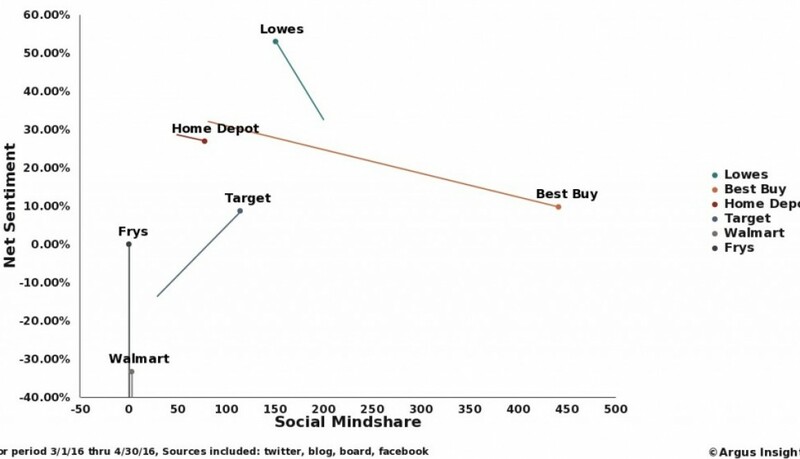 While Best Buy gained a small amount of buzz while participating in a Home Show, mentions across retailers were sparse outside of that, making up less than one percent of market discussion on Twitter. 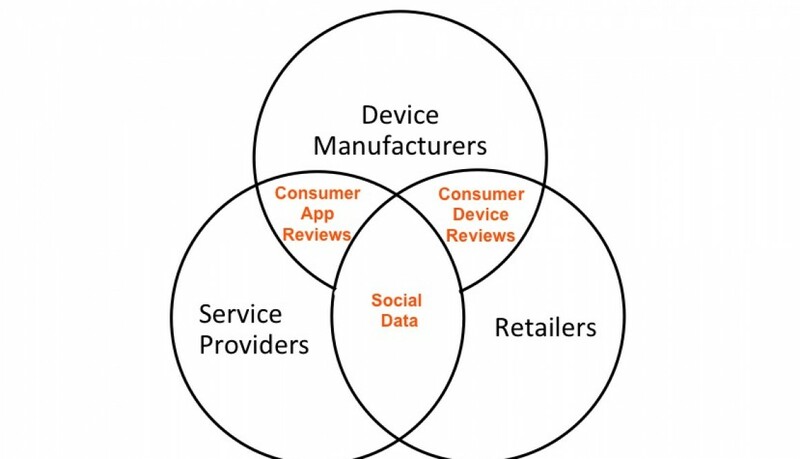 Though consumers review products across all retailers, brick & mortar and online, there is very little mention of retailers in social conversation about Smart Home. Check out our free market reports for more information about different facets of the Smart Home market, and receive regular insights into consumer trends with our free newsletter.